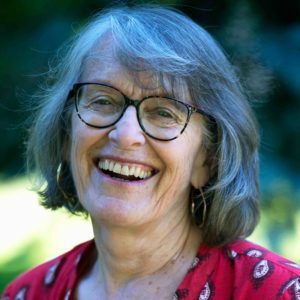 Kate Braid is the author of several award-winning poetry books and nonfiction books, ranging from her construction job experiences to Emily Carr to Glenn Gould. She left her carpentry career for what turned into a 23-year career teaching writing. Elemental(February 2018) is her most recent poetry collection. Currently, she divides her time between Victoria, Pender Island and Vancouver. Kate Braid appears in: Forest to Poet — Tree Walk & Being Here. Where? Here! Workshop on Sunday September 30 at the Mary Lake Sanctuary. Rhonda Collis: Your book of poetry, Elemental, is divided into common elements in the natural world such as water, fire, earth and sky. Wood is added and this is understandable given its significance in your past occupation as a journeywoman or carpenter. This brings the number of elements (or sections) to five which is the number of elements in the Ayurveda (air being the fifth in that system). Were you conscious of the five elements of the Ayurveda when structuring Elemental? Kate Braid: No –but a lovely connection, thanks for pointing this out. What I’d thought I was “borrowing”was the Chinese element of Wood. Interesting that the European system of elements we usually use, ignores wood. By the way, it’s “journeywoman carpenter.” It means a carpenter who’s passed their apprenticeship. Men (and some women) call themselves “journeymen”but it never felt right for me. I’d usually try and get by with “journeyed”so as not to make a point of it. To be fair, the poem “Swimming in Time”explores a comfortable integration with the element of water. I have been a swimmer all of my life but have a very deep-seated fear of current because of a near drowning as a child. What is your history with water? Are you comfortable around it? Do you fear anything about it? KB: Like you, I love swimming. I even like kayaking, but am basically terrified of sail boats and not great with motor boats. I haven’t yet been on a bigger boat (except a freighter, across the Atlantic, in a full gale) though I’m game to try. As a kid, there were no boats in my life, but when my husband got interested in sailboats, he wasn’t a very good sailor (I say this kindly, and he knows, so I’m not talking behind his back). Once he tipped the sailboat with him and our son in it and I had to pick them up at the hospital, decked in hypothermia suits tied with pink bows. Since then we’ve had a few terrifying excursions where we were caught in heavy currents so I now refuse to go out unless the water is perfectly calm, which it usually only is, at least in the Gulf Islands, around dusk. So we do a bit of motoring to nearby islands for supper, or to see seals, then straight home. Last time we were out we also ran out of gas. That hasn’t helped my fear any! The good news is that –as Tom Wayman would say –at least I got some poems out of it! RC: You have written two wonderful collections of poetry that explore artists of other mediums such as painters, Georgia O’Keeffe and Emily Carr (Inward to the Bones: Georgia O’Keeffe’s Journey with Emily Carr) and pianist Glen Gould (A Well Mannered Storm: The Glenn Gould Poems). In Elemental, there are about five ekphrastic poems (inspired by paintings). How do you come by the sources for these poems? Are you an art collector? In your memoir, Journeywoman, you mention visiting the Vancouver Art Gallery. Do you find it beneficial to visit art galleries and write the poems in situ? Do you reference the paintings from books? Has this ever inspired you to create your own visual art? Now that you are no longer working with wood as a carpenter, are you drawn to being a carver? KB: Good questions! I started writing poems responding to Emily Carr’s art, when I was still on the tools as a carpenter. I was virtually always the only woman on the job and there was a constant hum (spoken or not) implying, “What is shedoing here?” It was very lonely work. Also, for the first two years I was in construction, I lived in a small cabin in deep woods. I don’t paint or draw, but I love other people’s art so one day when I was wandering through the National Art Gallery in Ottawa, one of Emily’s paintings of forest hit me like a sledge hammer. I thought, “She’s got it!” She exactly caught the feeling of deep forest. After that, I read everything she’d written and took enormous strength from the fact that as a Victorian woman, she too had to defy her time and culture by doing what she loved –in her case, painting, in mine, construction. Emily became my (dead but not silent) mentor. After that, I regularly went to the Vancouver and occasionally Victoria Galleries and sat in front of her work. It felt literally like conversation with her, so I just wrote the conversations down, as poems. I“met”O’Keeffe when I happened to read that Emily met her once, briefly, in 1937, at one of O’Keeffe’s shows. These were my two favourite painters and I was electrified at the thought that they’d actually met. Nothing came of it for them, but by fluke, a few weeks later I spent 3 days in Santa Fe –O’Keeffe country –and loved the landscape. It started a rush of poems. What if they had travelled together? Where would they have gone? Well, first to the two landscapes that inspired them, of course, to New Mexico and BC’s rain forest. By further fluke, I’d just been accepted to UBC’s MFA program so I had two whole years to write this book! RC:“Earth”(the last section of Elemental),contains many poems about rock and stone and caves, as opposed to sand, or soil. Much respect has been given to miners, and with good cause. Do you think our culture abuses the earth with the large scale removal of trees and ore? During your life, have you ever felt compelled to become involved in environmental issues? KB: Utterly, we abuse the earth (and thereby ourselves, our air, our environment) by cutting down so many trees, beating up on the earth with damns and fracking, etc.. But what really triggered my awareness of Earth was doing a CBC Ideas program on the Cape Breton men’s coal mining choir, Men of the Deeps. It was fascinating to speak to men (all men) who spent their lives underground. I’d never want to do it, but I was intrigued by their descriptions –and their music. Their respect for the material –in their case, earth –and their camaraderie, were very like what I’d experienced as a carpenter. However, having said that, as a carpenter I’m also responsible for the cutting down of many, many trees. How do I deal with that? With some difficulty, but in the end I think that yes, we need shelter, and furniture, so it’s inevitable some trees will be cut. I think it’s a question of respect; I honour the materials I build with (including concrete, which is sand and gravel and cement–earth materials). I think if we all lived respectfully –in buildings that were no bigger than what we needed, using as much natural energy as possible, then it would be easier on the earth –and therefore easier on us. By the way, I was amazed, when I put this book together, pulling in poems that were both recent and others written years ago, that it came out as an “environmental”book. I’d had no idea, as I was writing, this would be the theme. RC: The “Wood”section of Elementalseems to be charged with a sort of reverence that surprised and delighted me. Having never personally worked with wood (power saws scare me), but loving the fragrance of fresh cut wood more than any perfume and just as much as fresh cut flowers, I loved the intensity you brought to the poems in this section, the respect and love. Trees in these pieces almost become God-like, or take on an intimacy like members of the family. It becomes clear that you are grateful for them being a part of your life. A couple of poems make mention of a father figure. Written in third person, “Younger Sister”explores a father-daughter relationship during which a daughter takes the place of a disinterested son in the wood shop and creates carvings. What was your inspiration for this poem? In “Lullaby for a Sick Father”the speaker petitions the trees for help. Is this because of her passion for them, or because the father also has a deep connection? Or both? KB: I wrote “Younger Sister”at UBC, when I was keenly aware of the number of what I felt were “famous male”poems that were being written in my poetry classes by other students. I started wondering –what about the sisters of those men? (Lately, other writers are exploring the famous men’s wives and partners.) It brought me this poem about Jesus’younger sister, and another about Napoleon’s sister, but that one didn’t fit this book. The poem, “Lullaby for a Sick Father,”came strictly from my passion for trees, the deep sense of life I get from them, that I imagined passing on to my dad who was very ill at the time. It was definitely not that my father had a connection with trees! It was a family joke that Dad was utterly hopeless when it came to building or fixing things. He’d always tell my mum to “Call the man!”if anything broke down. More often than not, it was my mum who plunged toilets, painted walls or flicked breakers. RC: Thanks so much, Kate, for your generous answers. Before we wrap up, I’m going to sneak one more question in because what interview is complete without asking, what are you reading now? I love this question because the answer is always different from one interview to the next, except for perpetual favourites. For you, I’ve discovered two of these are Rumi and Rilke. So, aside from them, which author (what book) are you currently reading? KB: I always seem to read several books at once and it’s mostly prose these days, partly because I’ve been (still am) going through the trials of Job in my life over the past year and find enormous support in Buddhist texts. (I’ve had a meditation practice for many years.) Interestingly, the Buddhists don’t seem to write poems, unless you count people like Jane Hirshfield, or the Japanese writers –and I’ve taken a couple of workshops lately in Japanese forms, which I love, including one with Terry Ann Carter. Other than that, I’ve snuck in Lorna Crozier’s What the Soul Doesn’t Wantwhich I found enormously comforting after the recent death of my mother, and Anna Swanson’s The Nights Also, Joe Denham’s Windstormand then there’s Wendell Berry…. and there are those elements again! Perhaps it’s that in times of hardship, I find the most comfort in nature? I don’t know. And perhaps I’m not the only one.